Confirmation provides an opportunity for a person to make a public declaration of their faith in Jesus Christ as Saviour and Lord. For those baptised as children, it is an opportunity to ‘confirm’ the promises made on their behalf in baptism. Baptism (or christening) is the simple ceremony of washing in water practised by Christians to symbolise the forgiveness and new life that we have with, and in, Christ. The confirmation itself takes place at a special Sunday Night Church service on the 4th of August. At this service our regional Bishop, Chris Edwards, will pray for the candidates and place his hands on their head as a sign of God’s blessing on them. This is a celebratory occasion where family and friends are warmly invited to attend. 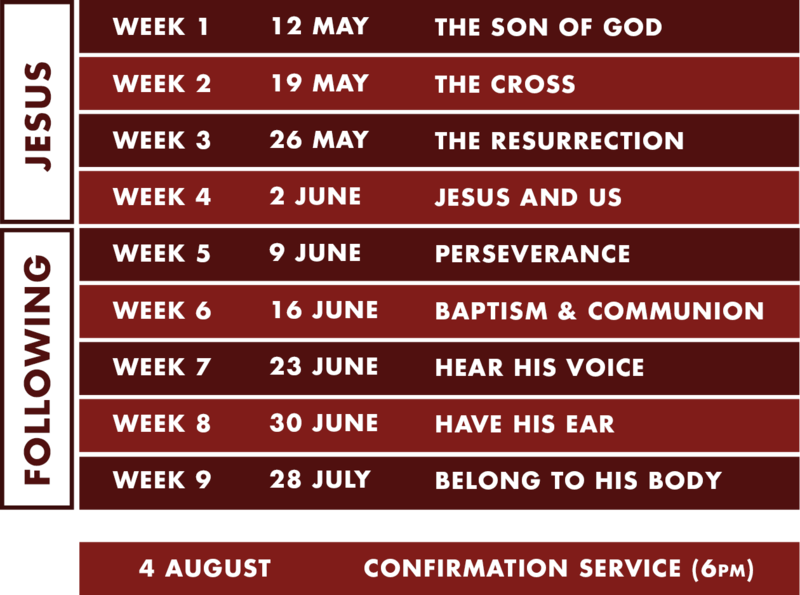 To prepare for confirmation we have nine classes on Sunday evenings from May-July. These classes provide an invaluable opportunity to ask questions, learn what it means to be a Christian, and take seriously what it means to live for Jesus. Confirmation classes are open to anyone in years 10 and above (or 16+). You might be ready to take a stand and confirm your faith in Jesus, in which case Confirmation is definitely for you. But that might not be where you’re at. Maybe you just want to find out more about Jesus and Christianity, or maybe you have been coming to church for a while and have never seriously considered the Christian faith for yourself or what it means for your life. You are at an age where you are making big decisions that will impact the rest of your life. We think taking nine Sunday afternoons out of your year is a valuable investment in thinking through big questions about God, life and faith and what they mean for you. WHAT IF I HAVEN’T BEEN BAPTISED? Then the confirmation classes will help you consider whether or not to get baptised and make a public declaration of your faith in that way. You can also be confirmed on August 4th, but your baptism will be the most important next step for you in your faith. We can make arrangements for your baptism to take place some time during term 2 at either Elevate of SNC. The course is divided into two halves. Weeks 1-4 are open to anyone, with no commitment to be confirmed. This chunk of the course is an awesome opportunity for you to find out what Christianity is all about with no strings attached. We look at the core message of the gospel – who Jesus is, what he’s done and what that means for us. If after that you decide to get confirmed you will have the opportunity to continue into the second half. The “following” section of the course gives you the tools to take responsibility for your adult Christian life. We pray this time will be a blessing to you as you set out on a life long journey of faith. It is expected that candidates will attend all nine Confirmation Sessions (or arrange a catch up for any missed), as well as come along to our Sunday Night Church service at 6pm for the duration of the course. Each session runs from 4:30-5:30pm on the Sunday afternoons specified below. This will be followed by a light dinner before we go to Sunday Night Church at 6pm.